On a typical weekday in London, commercial vehicles make 280,000 journeys, covering a total distance of 18 million miles. 75% of the freight vehicles involved in these movements are vans, covering an average of 64 miles per day. These are staggering figures, especially when you consider that the vast majority of the vans and trucks involved are diesel vehicles. Urban pollution from diesel is already a major public health issue. While the Euro 6 emissions standard promises to achieve a reduction where Euro 5 failed, diesel-fuelled air pollution is still a concern, as is the noise pollution caused by all these rattly diesel engines — still far louder and more raucous than petrol equivalents. In an effort to improve the situation and prepare the ground for a large-scale move into the electric vehicle market, Ford has partnered with Transport for London to launch a 12-month trial of 20 plugin hybrid electric vehicle (PHEV) Transit Custom vans. One of the 20 new Ford Transit Custom PHEV due to go start a 12-month trial in London later in 2017. 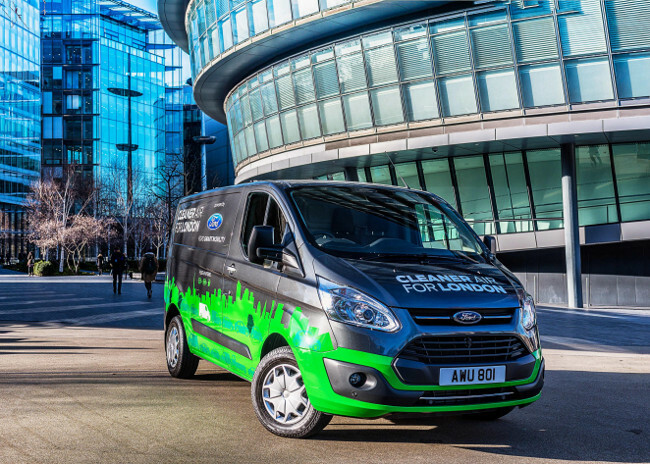 Ford will provide 20 PHEV Transits to a range of commercial fleets across London, including Transport for London’s fleet, to explore how such vans can contribute to cleaner air targets while boosting productivity for operators in urban conditions. The project is supported financially by the government-funded Advanced Propulsion Centre. These vans are forerunners of the Transit Custom PHEV production model that’s scheduled for commercial production in 2019. 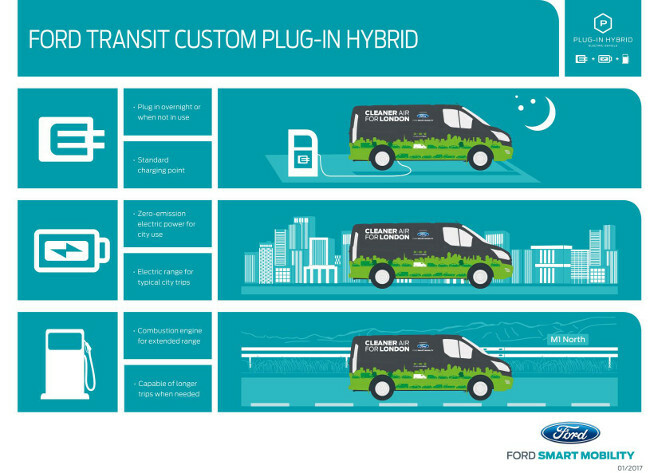 Ford is the first company to offer PHEV functionality in the van sector. The idea is that the vans can be charged from the mains and will run solely on electric power for the majority of the time they’re operating in Central London. They will however retain the ability to cover longer distances without recharging using their standard engines. Ford is planning to launch 13 electric vehicles globally in the next five years. The Transit Custom PHEV is one of these. In my view, the operating case for electric vans in cities has already been made several times over. It remains a mystery to me why — for example — large postal operators in other European countries are buying thousands of electric delivery vehicles, while Royal Mail chooses only bicycles and diesel vans. Hopefully London Mayor Khan will be a more forceful and effective advocate of electric vans than his predecessor. It’s high time that London and the UK started to lead the way in modernising Europe’s transport infrastructure and vehicle parc.